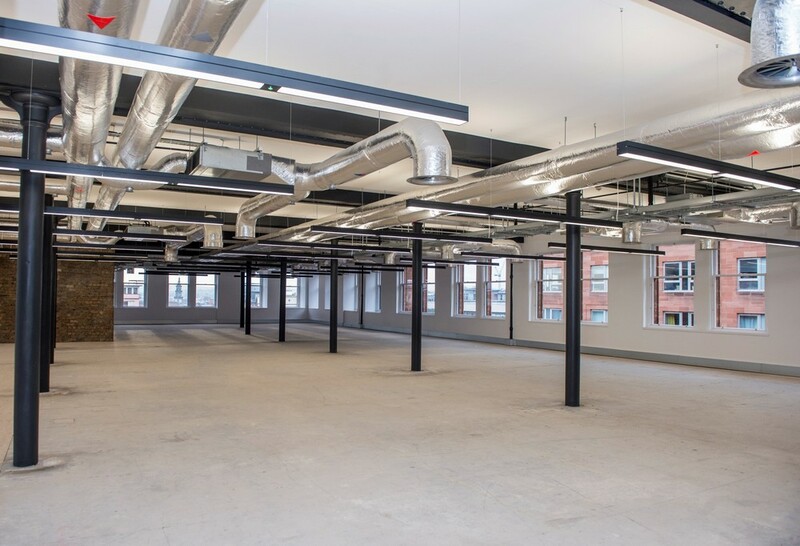 19 December 2017 – The Garment Factory, a unique and contemporary office development in Glasgow’s city centre, has achieved practical completion following an extensive refurbishment project undertaken by Castleforge Partners. 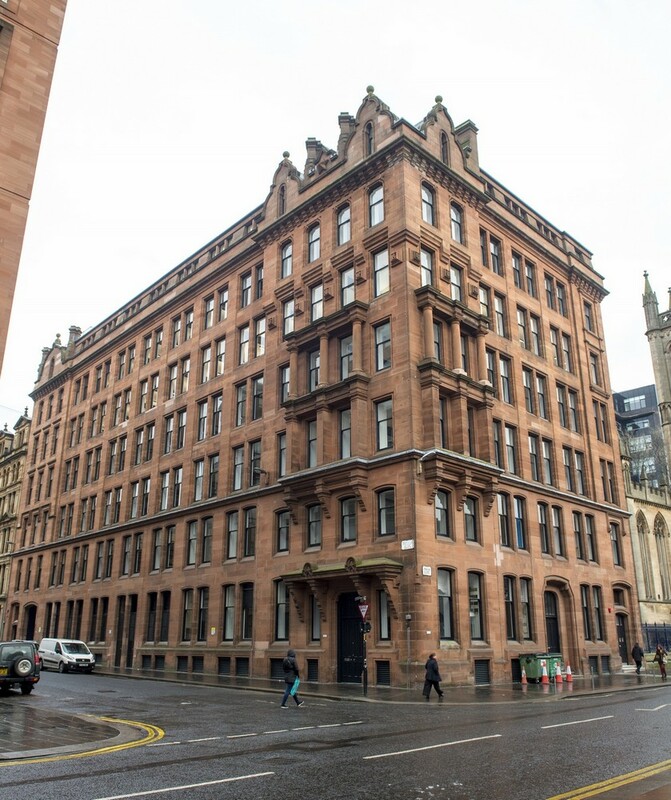 A category ‘B’ listed building located at the corner of Ingram Street and Montrose Street in the Merchant City Central Conservation Area, the Garment Factory is one of Glasgow’s most notable buildings. It provides 47,382 sq ft of high quality retail and design-focused office space over seven floors. The £6million refurbishment project, undertaken by a team which includes lead contractor ISG, project manager PMP and architect Morgan McDonnell Architecture Ltd, involved combining the restoration of the original features, including exposed ceilings, steel and brickwork, wooden flooring and ornate staircases, with the introduction of contemporary finishes throughout to provide a 21st century workplace. 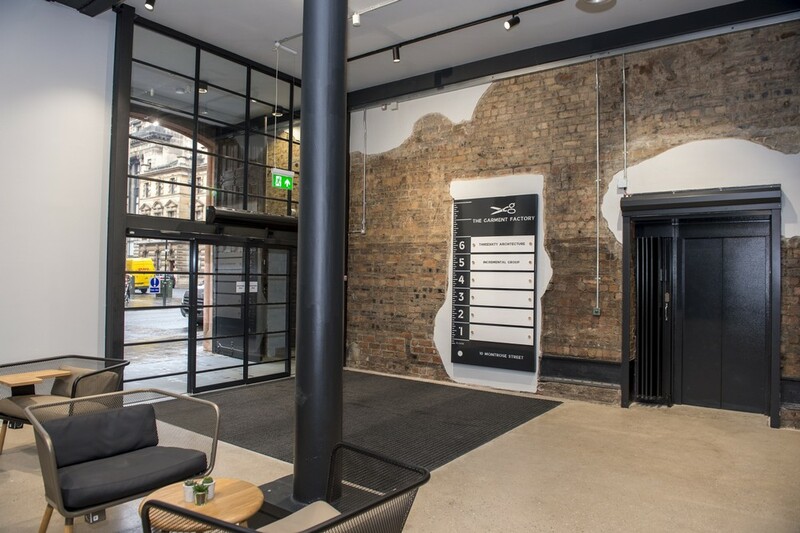 An impressive over-sized entrance lobby/reception with two new high-speed lifts, on-site café and breakout space has been created on Montrose Street to serve the office floors above. Two new retail/restaurant units on Montrose Street and Ingram Street have been formed and offer quirky features including covered outdoor dining areas and a triple level spiral staircase, which is attracting interest from leisure operators and boutique breweries. The basement area has shower and changing facilities as well as lockers and a cycle storage area, event space, games room and communal kitchen with LED lighting throughout. Works on the open plan office space over the upper six floors included a full overhaul of the suites with the introduction of new finishes in keeping with the building’s listed status. The existing stairwells have been retained and refurbished and the building’s mechanical and electrical services have been replaced and upgraded. The exterior of the red sandstone building has also been conserved and the roof has been extensively overhauled. Rachael Pittaway from Castleforge Partners said: “It’s great news that we can announce we’ve achieved practical completion at the Garment Factory; it really is a beautiful building in a great location and we’re very proud of the finished result. 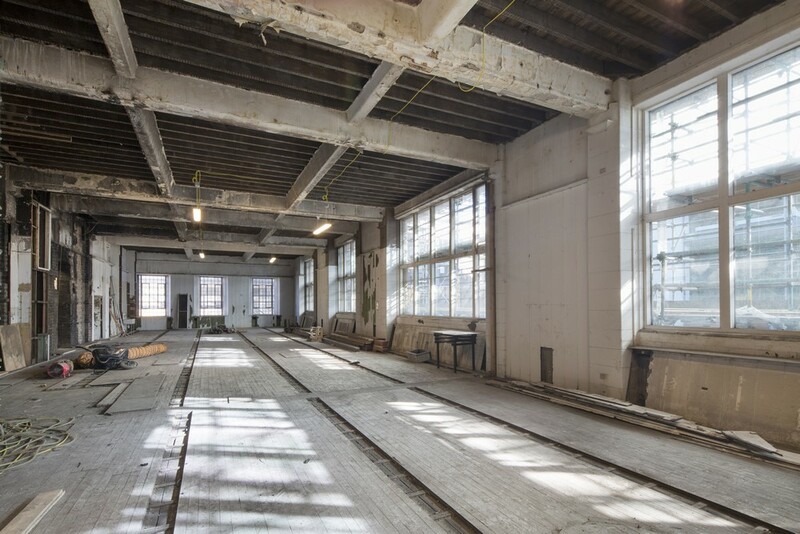 We wanted to restore the building’s original industrial aesthetic and emphasise the warehouse/factory origins by making features of the cast iron columns and leaving services exposed to allow the original fabric of the building to shine. Architectural practice Threesixty Architecture and digital services provider Incremental Group were confirmed as the first occupiers for The Garment Factory earlier this year. Threesixty Architecture has taken the entire top floor, comprising 8,374 sq ft of space, and Incremental Group will occupy the whole of the fifth floor, extending to 8,353 sq ft. Both firms are currently undertaking fit-out works ahead of taking occupation early next year. 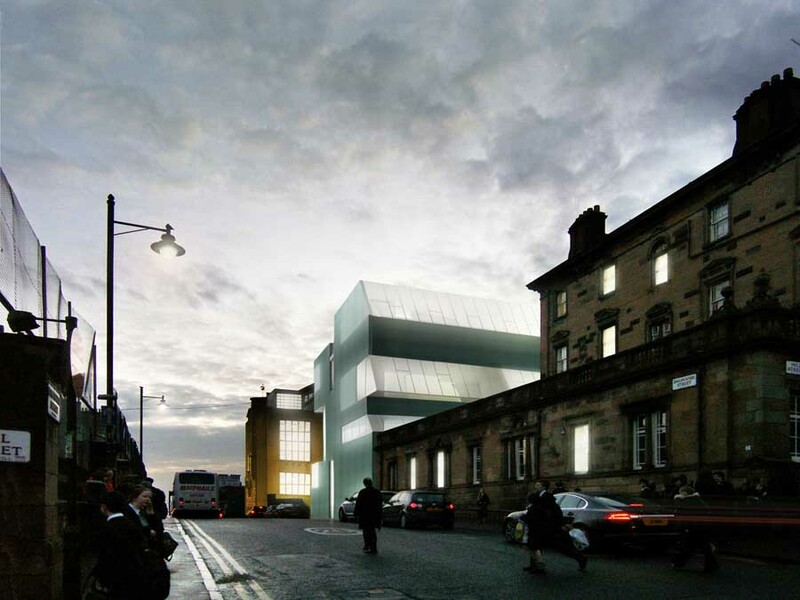 The Garment Factory is a historic and well-known building in Glasgow. Built in 1898 to the designs of prolific Glasgow architect James Thomson, it was originally the garment factory of J & W Campbell. During World War II the basement was converted to a bomb shelter with the addition of a steel crash deck and brick internal partitions. Previously owned by Glasgow City Council, it was empty until Castleforge Partners purchased the building in 2016. The Garment Factory is being marketed for let by Ryden.